Recently Michelle and Dexter tied the knot with a gorgeous modern yet elegant wedding in Melbourne. Alongside the National Gallery of Victoria, Michelle and Dexter looked as elegant as you’d imagine. Contrasting against the modern scenery, the couple appeared as though they were in a vintage romance film. Michelle was radiant in her classy and simple gown with subtle lace embellishments, satin accents, and gorgeous smile, she looked beautiful. Complimenting the choice of scenery, Dexter looked sharp in his perfect grey suit. The mix of contemporary and classic styles was perfect for the couple. A wedding with classic vintage touches isn’t complete without the perfect car. 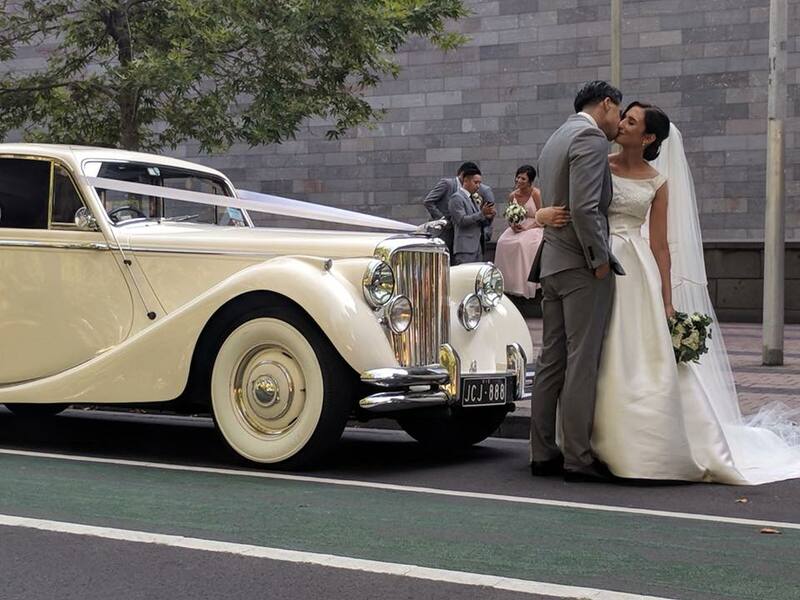 Michelle, Dexter and the wedding party were once again fit for a vintage film with JC Jags’ classic wedding cars. JC Jags classic cars are expertly chauffeured and immaculately cared for. Perfect for adding the finishing touches to your wedding or other special occasion. JC Jags’ wedding cars will give your wedding the perfect amount of classic elegance. You’ll be treated like royalty every step of the way. The professionally maintained and expertly driven cars will help make your wedding memorable to all your guests and you’ll feel like royalty with our uniformed chauffeurs. JC Jags have the perfect cars to suit every wedding or special occasion and the staff will look after you every step of the way. They love what they do and want you to love it to. JC Jags wishes all the best to Michelle and Dexter, thank you for choosing JC Jags for your wedding day.